Pet obesity is a growing epidemic. 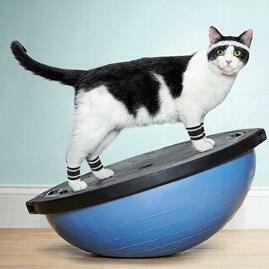 If your cat or dog is overweight, it can be discouraging but there is hope. In addition to measuring out portions carefully, keeping treats to a minimum and ensuring your pet is getting daily exercise, here are a few more weight-loss tips to help your pet lose weight. 1- Avoid dry food as it is high in carbohydrates. Feed your overweight pet more protein to control insulin spikes. When we eat carbohydrates, our insulin spikes rapidly after and we feel hungry again. A high protein diet with plenty of fiber in the form of vegetables mixed in can help your pet feel full and feel better! 2- Avoid High Fat Treats--For ex: A tablespoon of peanut butter or coconut oil can be nearly as many calories as a 1/4 of a13 oz can or 1/4 cup of pet food---it is highly caloric. If you use peanut butter to administer pills, try putting them in a small amount of canned food or pumpkin instead. 3- Feed 2 -3 Smaller Meals-Small meals regulate your pet's blood sugar and improve digestion. Best not to FREE feed even in multi-cat households as usually some pets end up overeating while others undereat. Use a small amount of pumpkin or add some green vegetables to help your pet feel more satiated. 4- Use vegetables, especially green vegetables to help your pet feel more satisfied--Fiber naturally slows down the digestion of sugars so adding plenty of fiber in the form of green vegetables will help regulate your pet's blood sugar and help them feel full. You can also use a small amount of pumpkin as well. Good vegetable choices for dogs: green beans, squash and a small amount of carrots. Many cats like pureed asparagus if it is mixed into their food.